Here at Switchback Travel two things are true: We love remembering the ways of the past, and we sure are glad that we live in the present. Perhaps nothing in the past 30 years changed climbing as much as the invention of sticky rubber and the modern climbing shoe. We can now tiptoe, toe hook, heel hook, jam, edge, and smear to the tops of routes the greats of yesteryear deemed impossible. And you can be one of them, but first you’ll need a pair of climbing shoes. So how do you decide which pair to buy? Well, come along then. This article will answer all your questions about climbing shoes and get you on the wall in no time. Imagine a brick wall. Now, where the mortar is, imagine it’s sunk back into the wall about an inch or so. The cracks between the bricks are still small—maybe half an inch wide—but you can get your fingertips into those cracks. Now try to imagine climbing that wall in a pair of tennis shoes. Can you feel your feet slipping on the flat brick surface? You try to wedge the tip of your shoe into those cracks in the mortar, but the front of the shoe isn’t tapered enough, the rubber isn’t sticky enough, and your toe isn’t curled into a position of power to help you. Your feet can do nothing to help you, your arms get tired, and you fall off the wall. If you’ve ever climbed you know this feeling. If you’re a beginner, you’ve felt it on footholds much bigger than the cracks between bricks. If you’re an expert, you’ve felt it on footholds much smaller. But either way, you’ve felt it. Between a ladder and a pane of glass exists that happy medium between too hard and too easy. Everyone’s happy medium is different, but one thing common to every climber is that to climb the most challenging climbs, we need the best footwear for our feet and for that particular route. Rock climbing shoes are built, and have been modified and adapted over more than 30 years, to push our personal boundaries closer to that pane of glass (you can see our picks for the best climbing shoes of 2016 here. The rubber is specially formulated to stick to slippery surfaces, the sole is crafted to provide a solid platform to stand on tiny edges, the shape of the shoe is modified depending on the desired steepness of the terrain, and the rubber is spread over the toes and heels to allow for toe and heel hooking. Climbing shoes are as highly specialized and technologically advanced as the harnesses and ropes that catch us when we fall. Sole (outsole). The sole is the rubber exterior on the bottom side of the shoe. This is where the actual contact between your feet and the rock almost always occurs. There are scores of different rubber blends used for climbing shoe soles, each with varying degrees of stickiness and durability (more on that below). Some shoes have split soles, which eliminate the middle part of the sole in exchange for two separate rubber patches for greater flexibility through the arch of the foot. Technically, what is commonly referred to as the sole is actually just the outsole, while the sole itself is comprised of outsole, midsole, and insole. Midsole. The midsole is what sits on top of the rubber sole of the shoe. Its job is to provide rigidity to the shoe, as well as to create and maintain the shape of the footbed. Climbing shoes undergo a lot of torsional and flexional pressures, so the midsole is usually composed of a highly flexible, resilient, lightweight and thin plastic laminate. Footbed (insole). This is the part of the shoe that your foot physically stands upon. It covers the midsole and usually is composed of a durable synthetic leather or leather material. Heel/heel cup. All climbing shoes have some sort of molded heel that is specifically shaped to fit a typical human heel. Some shoes have a highly molded cup-like shape that supports the heel while driving the toes forward, creating greater power in the front of the shoe. Internally a heel cup has the same material as the footbed. Externally it’s composed of sticky rubber. If the external part of the heel cup is mostly just exposed leather or synthetic leather material, it won’t be as useful for heel hooking or have as aggressive of a fit. Toe box/Toe Rubber. Any climbing shoe worth its salt will have a precise fit on the toe. The toes should be tightly supported in the front of the shoe (the toe box) as much as can be done comfortably. With climbing shoes, the goal is almost always the elimination of dead space and the toe box is no exception. It should be tight from top to bottom and side to side. On the top of the toe, externally, you’ll often see a patch of climbing shoe rubber. This toe rubber is important for any sort of steep climbing you may want to do, whether bouldering or sport climbing. Upper. The upper is the part of the shoe that rests upon the top and sides of your foot. Uppers typically are a soft, durable fabric composed of either high quality leather or synthetic leather materials. Most of the upper of a shoe tends to be free of rubber and should be comfortable and wick sweat well. Closure. This part of the shoe tightens down the upper and makes the whole shoe fit snugly and firmly to your foot. We tend to break climbing shoe closures into three styles: laces, velcro, or slippers. The latter is a bit of a misnomer as the slipper is not the closure system itself, but the elastic swaths that run along the sides of the upper, allowing the shoe to stretch back down tight on the foot after you put it on. Two excellent climbing slippers are the classic Five Ten Moccasym and newer Evolv Addict. 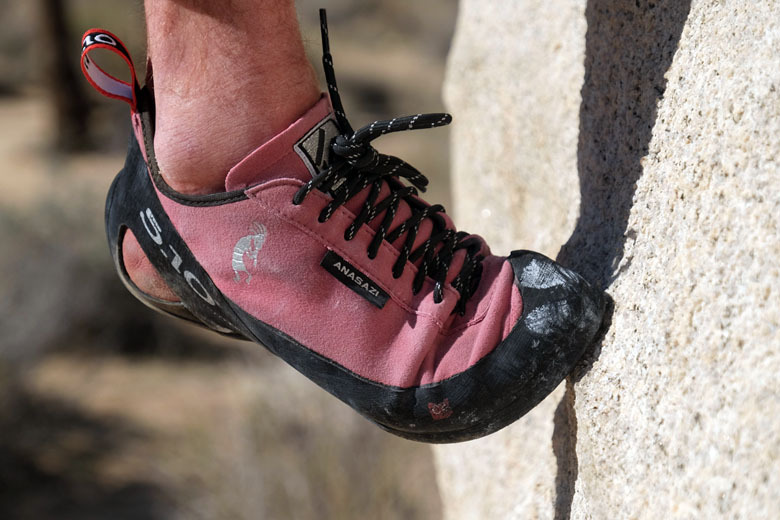 Many high-end bouldering and sport climbing shoes feature a hybrid closure system, employing some combination of elastic and laces or elastic and velcro. Pull tabs. Putting on a properly fitting pair of climbing shoes is not easy. To help, most shoes feature small woven loops on the back, and sometimes front, of a climbing shoe that you can stick your fingers into and pull the shoe on. Last. The last is the physical foot shape the shoe was modeled upon. There are lasts for wide feet and narrow feet, short feet and long feet, feet with high arches and feet with low arches. Ultimately, the last a shoe is built upon (along with the shoe’s ability to adhere to that shape) dictates how well the shoe will fit your foot. Many shoe companies use the same last on various models. So if Shoe A and Shoe B are built on the same last, you can expect them to fit similarly. Asymmetric shape. This isn’t really a part of the shoe per se, but it’s an important aspect of most climbing shoes. If you look at your bare foot, you’ll probably notice a bit of a taper in the toes from the big toe to the back. 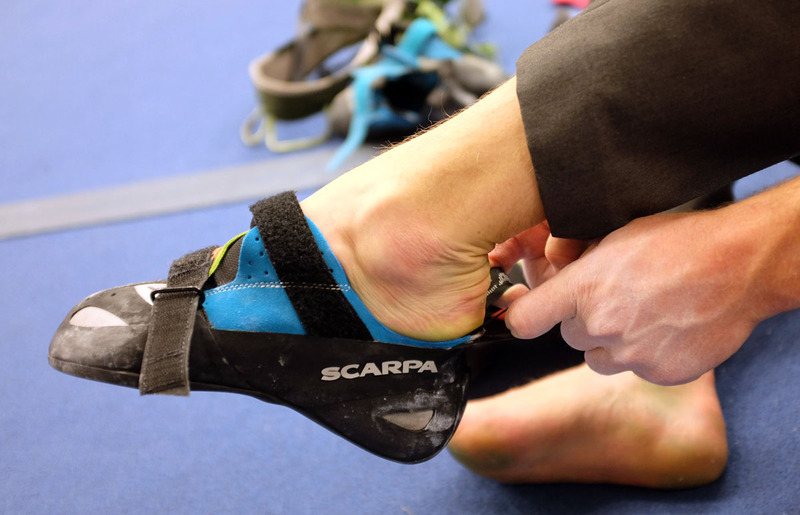 The front of the foot is typically asymmetrical, so why should your climbing shoes be? When talking about the toe box, or the toe of a shoe, you’ll often see the term asymmetric. This simply means it contours to this tapered shape. High tops. There aren’t many, but there are a few excellent climbing shoe models that feature more of a high-top construction, covering and protecting the ankles from abrasion in off-width cracks. We think the La Sportiva TC Pro is the best high-top shoe out there. 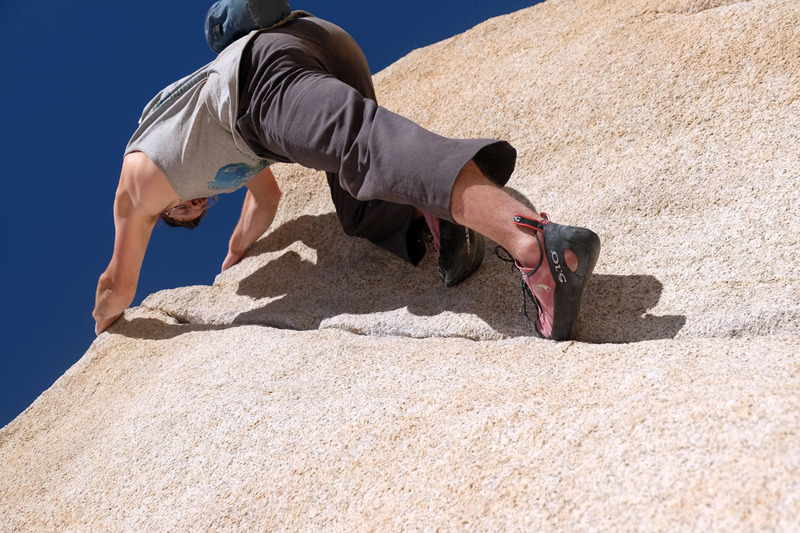 Bouldering, sport climbing, and trad climbing are vastly different disciplines. Therefore, it makes sense that for each discipline there would be vastly different shoes that excel. Below is our breakdown of what to look for. Bouldering. Bouldering is all about cramming as much strength, energy, and awareness into a few quick moves as humanly possible. 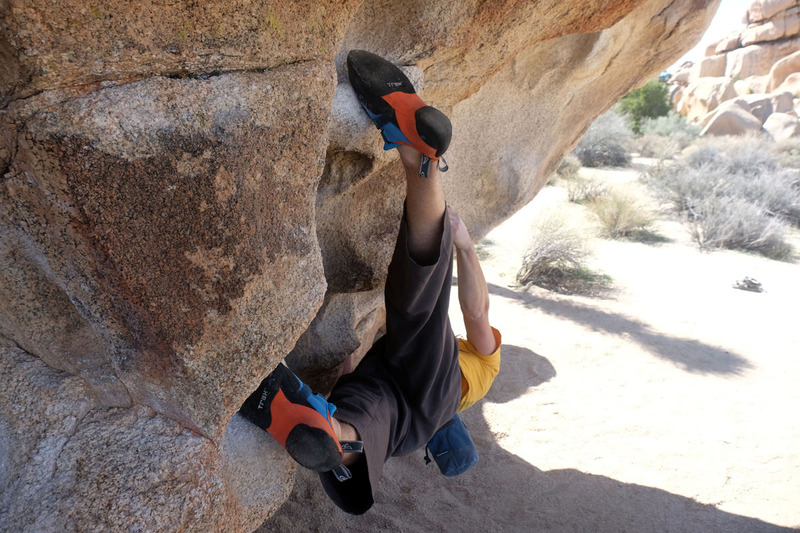 Similarly, bouldering shoes are all about cramming your feet and toes into as tight and aggressive a fit as humanly possible. Here’s what to look for: an aggressive downturn (think banana shape), ample toe rubber patch, floppiness for sensitivity, rounded heel cups covered in rubber, and a hybrid closure (half-sock elastic slipper with a single velcro strap or laces). Sport climbing. Sport can really go both ways. It can be tough slabs, vertical pockets, or dramatic overhangs. Often, the best bet is to have a variety of different sport climbing shoes in your quiver depending on the terrain. But sometimes, you can find a single all-arounder, like Five Ten’s Anasazi or La Sportiva’s Miura, to handle all kinds of scenarios. 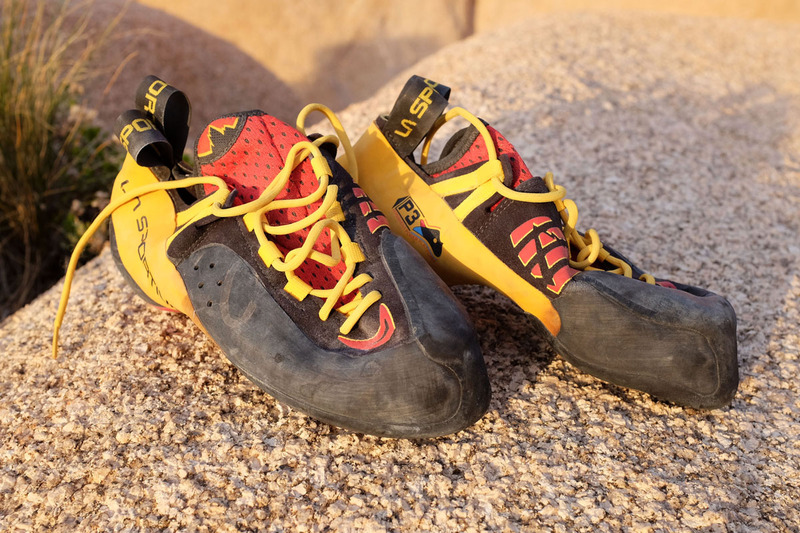 Here’s what to look for in a sport climbing shoe: a solid edging platform, gentle to serious downturn, tight heel cup with a slingshot-style rand, stiff midsole, laces or Velcro closure. Trad. Trad climbing shoes lose a little bit of performance for comfort’s sake since you tend to spend so long in them. Even single pitch trad climbs typically last much longer than sport climbing battles. Besides, the kind of terrain you are tackling is almost always less steep. Here’s what to look for: very slight or no downturn at all, stiff midsole, more relaxed fit, less heel/toe rubber, ankle protection, laces velcro or slipper. In the eye of the beholder (or on the foot of the beholder, anyway). Look, you’ll get people who absolutely swear by a single type of climbing shoe rubber, and people who move fluidly back and forth between them. Do different rubbers have vastly different feels when climbing? Yes. Do some last longer than others? Yes. Are some stickier than others? Yes. Is there one that we can universally say is the best? No. It’s just not that simple. Different rubbers serve different purposes and do different things. Different climbers will like them to varying degrees. That said, here are our opinions of the matter: Stealth and Vibram are the best in the field. There are many versions of each: we love C4, HF, and Mi6 from Five Ten. Vibram’s XS Edge and XS Grip lines are awesome as well. We like Evolv’s Trax and Madrock’s Science Friction to varying degrees. Trax seems to feel slick at first but breaks in very nicely. Science Friction often feels very sticky from the get-go but doesn’t last all that long. In the end, just about any shoe rubber today beats the boots John Gill was wearing when he invented and mastered bouldering. Beginner shoes really are just basic climbing shoes. That’s good, because as a beginner you don’t need your shoe to have a higher IQ than you do. It should be adequate but not too expensive or fancy. As a beginner, you should focus more on what your feet are doing than what they are wearing. With very few exceptions, beginner climbers spend a lot of time on easy and intermediate terrain: V0-2, 5.5-5.9 and typically indoors or outside in modern sport climbing or bouldering areas. By virtue of the difficulty of the routes beginners are climbing, the footholds by and large tend to be a lot better. In other words, what makes the routes challenging is not the footwork, but just the nature of climbing in general. You can get a fancy pair of shoes as a beginner, but chances are the major advantages will be of little use to you. What matters as a beginner is learning movement techniques, ways to position your body and transfer weight and balance effectively, strengthening your forearms, fingers, tendons, and core muscles. None of this has the slightest to do with sticking to tiny footholds that barely exist. Those are, of course, important, but as a beginner you have bigger fish to fry. You also may end up climbing a few times and then deciding you don’t like it. You may decide you love it, but destroy your shoes quicker than more experienced climbers because your footwork is less honed and your feet drag a lot more. Either way, you won’t gain much by spending a lot on a fancy pair of shoes. Just get something cheap and highly rated—see our best beginner climbing shoe article—and save the more expensive shoes for down the road. If you’re an expert rock climber, you probably already know much of what we’ve covered in this article. You know what the rand of a shoe is, you know the difference between HF and Mi6, and you know the difference between the La Sportiva Solution and TC Pro. But there may be some things you don’t know. Here are a few little tidbits that you may find useful. Resoling. Like the fit of the Miura, but prefer Five Ten rubber? Consider climbing out the Vibram rubber for a few months, and then sending the shoes into a resole shop with specific instructions to resole with C4, Onyxx, or whatever you prefer. Not everyone will do it, but Rock and Resole in Boulder, CO will. Pull tab issues. Having trouble getting your shoes on using the pull tabs? Clip a quickdraw or carabiner to each of the pull tabs on the back, and now try. That should make a big difference. No Edge. Have you ever heard of No Edge technology? La Sportiva has featured these round-edged soles on the Speedster, Futura, and now the Genius. The performance on microscopic nubbins is out of this world, but mostly on outdoor rock. Indoors, the No Edge concept tends to fall short of edgier styles. Breakthrough companies. Tenaya is a climbing shoe company on the up and up. You may have heard of them, but in the U.S. their merger with Trango could have intriguing results. Expect the quality to either continue to improve or to go sharply downhill, as mergers always change something. If you’ve never heard of Butora, check them out, too. This Korean shoe company has been drawing some attention lately, and we’re interested to see what happens as they grow in the American market. Evolv is a super cool company as well, and the only company we know of that makes shoes specifically for people with Morton’s toe (second toe longer than first) and allows you to buy in split sizes. Expanding feet. You may not realize that your feet expand over the course of the day. Hence, if your shoes fit great when you tried them on in the morning, they may be a bit tight when you put them on to climb in the evening. Buy accordingly. Gender matters very little when buying climbing shoes. Men’s models tend to be wider in the forefront and heel, and the fabric of the upper comes up a bit higher. Women’s models tend to be the opposite. Of course, any male might fit better into a women’s shoe or vice versa. Mad Rock has even tried to do away with these problematic distinctions by going with gender-neutral models of their shoe like the Pulse. The Pulse comes in Positive (wide), which is Blue, and Negative (narrow), which is Red. The bottom line is: buy whichever shoe fits and works best for you regardless of the gender provided by the manufacturer. Resoling typically needs to occur as soon as you start to break through the sole (usually in the tip of the shoe right under the big toe). You’ll start to see a little circle develop where the sole has given way and sometimes a very slight crack in it. This is the time to stop using your shoes and send them in. 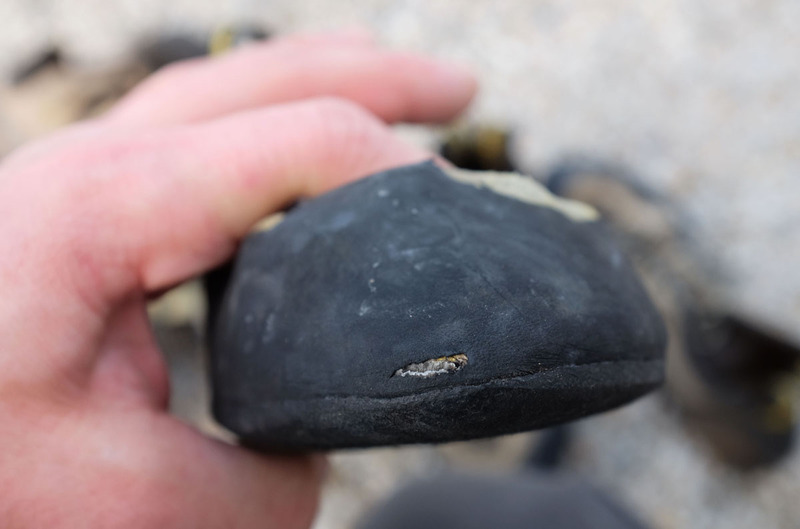 If you wear the shoes until you develop a physical puncture and can see fabric or materials that are not rubber, you’ll have to pay for a toe cap as well as a resole, which can run you an extra $10-$15 per shoe. If your kids are small enough to fit into one of those tiny kids models, don’t bother. They almost certainly aren’t dexterous enough for it to matter if they are in sticky rubber or just velcro sneakers. If they are big enough to fit into an adult’s pair of climbing shoes, then you should probably get them a pair. They really do make a big difference when your body is developed enough to know how to use your feet with some precision. They say: “If the shoe fits, wear it.” But with climbing shoes, how do you know if it fits? Should it be tight? Should it hurt? Should it feel impossible to get on or off? How much room should be between your toes and the front of the shoe? Shoe fit is as individual as the feet going in them and depends a ton on experience level, materials, type of climbing, foot shape, and pain tolerance. The most important thing is to be honest with yourself: how tight can you go without letting the discomfort get in the way of the joy of climbing? That’s probably the most important question, and a lot of people will sacrifice pain for the extra performance it brings to their climbing game (that extra performance in turn increases the amount of joy they get out of climbing). Others will find that even a little discomfort is a major detractor from the experience, and will gravitate instead to looser and therefore lower-performing shoes. You also should also take into consideration that leather stretches over time while synthetics generally don’t. And because leather stretches, it conforms to your foot and takes on the shape of your foot with the result of increased comfort. But you also have to buy leather shoes smaller and deal with a sometimes painful break-in period. Synthetic shoes are more predictable but have a harder time ever reaching that true glove-like feel. You’re interested in which specific climbing shoes we prefer? We are glad that you asked. With over 15 years of climbing experience, we’ve had a chance to test many shoes on the market across brands and price points. And we always try to stay up to date on relevant new models and interesting releases. For the top overall shoes on the market regardless of skill level, see the best rock climbing shoes of 2016. Newbies and those just getting into the sport should see the best climbing shoes for beginners. We’re also excited to be launching a full landing page dedicated to our individual climbing shoe reviews in the near future. Each climbing shoe manufacturer has its own style, branding strategy, athletes, claims to fame, and pitfalls. So how do you choose one over another? The best way is to figure out which company’s shoes tend to fit your foot the best. But in case you wanted a little more info, we’ve made the following list of the ten most prominent climbing shoe manufacturers to try and capture the essence of each company (in alphabetical order for fairness). Of course, this is only like our opinion, man. Boreal: Are these guys still around? Spanish company. Fading. Bottom shelf. Butora: New Korean manufacturer. Not well known. No shelf yet. Climb X: Mad Rock copycat. Sierra Blair Coyle. Bottom shelf. Evolv: “Vegan” shoes, split sizes, American made, Chris Sharma, Ashima Shiraishi. Sport and Bouldering. Middle shelf and on the rise. Five Ten: California. Industry pioneer. Trad, bouldering, sport. Recently purchased by Adidas. Sasha Digiulian, Dave Graham, Thomas Huber. Top shelf. La Sportiva: Italy. Industry pioneer. Trad, bouldering, sport. The standard for quality craftsmanship. Daniel Woods, Tommy Caldwell, Alex Honnold. Top shelf. Mad Rock: Made in Vietnam. Budget shoe. Cost over quality, but not a bad balance. Jan Hojer, Megan Mascarenas, Obe Carrion. Top of the bottom shelf. Red Chili: Denmark. Been around a while but never made a splash in U.S. market. Stefan Glowacz, Ines Papert. Middle shelf. Scarpa: Italian. Expensive as Sportiva but not quite on the same level. Quality craftsmanship and materials but lacking in legacy models. Will Gadd, Alex Puccio, Josh Wharton. Upper-middle shelf. Tenaya: Spanish, purchased by Trango. Up and coming. Keep an eye out for them. Alex Megos, Ethan Pringle, Josune Bereziartu. Upper-middle shelf.